It’s a crisp fall afternoon. The leaves crunch beneath my feet, and my breath trails behind me in large puffs. My cheeks are red, wind-burnt, and my nose runs uncontrollably. I make the final trek to the top of the hill and stop, out of breath. I look out over the campus that the bronze eyes of Robert Frost’s statue mulls over, at Baker-Berry Library, standing tall, and I rest my foot on the stump that reads “Lone Pine.” It is the Saturday before senior fall begins, and a wave of nostalgia washes over me. I reminisce about the many times I have retreated to this very spot, to chat with Robert although he won’t answer back. I used to perch on this very stump and look out over Baker-Berry for answers that it couldn’t give me. I begin to muse about my time at Dartmouth: how I’ve learned to be a “lone pine,” fiercely individualistic, but also learned to find safety in groups, searching for my “forest.” Dartmouth has somehow given me both, teaching me to be comfortable alone and within large groups. For both lessons, I am grateful. It is freshman fall. The air is crisp, and everything is new. I am eager. I slowly glide forward in my seat, attempting to keep time with the woman in front of me as I hear the coxswain shout in my ear, “Catchhhh, SEND.” I was a walk-on member on the women’s rowing team, brand-new to the sport. All I wanted was to contribute; to show my coach and new teammates that I would put in the work; to prove that I could get the hang of it and to demonstrate that I could be a contributing member of this team. I wanted to confidently shower in the locker rooms, chatting nonchalantly as the recruits seemed to, and walk into the Class of 1953 Commons with the rowing team, knowing that a giant table of familiar faces would be waiting on the “dark side” of the dining hall for us. I wanted to have upperclasswomen role models who would show me the ropes. I wanted to be a part of a community. I signed up for more clubs that I could count, searching for a group of people who would be “my people.” My freshman year was spent seeking out my own forest at Dartmouth. Now it is sophomore year, and I find myself standing on top of a table while a group of women shout my name in praise, screaming “Welcome home, Allie!” I am sporting a new shirt, decorated with Greek letters, and my heart surges. Wow — I am a part of something awesome. However, as sophomore year progressed, I spent many a night talking with one of my best friends who was not welcomed by the women’s rush process. Her confidence and sense of self was shaken by the fact that she was not chosen to join one of these communities. 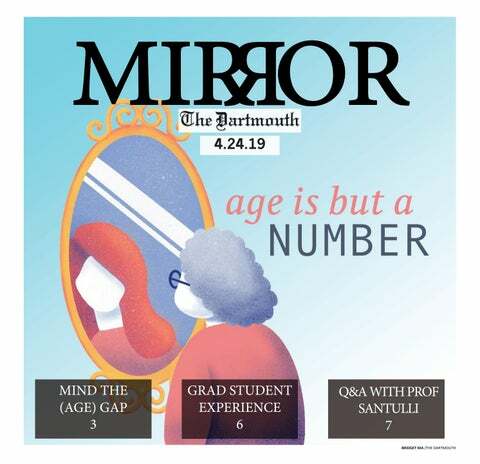 I began to wonder: What is Dartmouth doing wrong? What am I doing wrong? How am I complicit in this process that creates such insecurity? What can I do to change that? I also realized that rowing was not my passion but something that felt comfortable — a point of validation, a concrete, stable community. During my sophomore year, I found that some forests are not as organic as others, and I questioned which ones I would continue to take part in. Now it is junior year, and suddenly I am no longer at Dartmouth, unable to walk to Robert Frost for a quick chat or to dining halls to be greeted by a sea of familiar, friendly faces. Suddenly, I am in a different country, one where everyone speaks English with musical accents and the street performers wear kilts. Academically, I am challenged to understand and present the opinions of ancient philosophical writers — what are they actually saying? Do I agree? How does my personal bias play a role? I find myself discussing these writers with my fellow Dartmouth classmates in coffee shops, in pubs and on walks through museums. I am forced to take a side on everything. I’m forced to form opinions and defend them. I am forced into a new type of maturity. As I sat on the floor of the Copenhagen airport at 6 a.m., thinking about this whole “adulthood” thing, I was told by the woman at the EasyJet desk that the company I booked my flight through had not actually processed my ticket, and my name was not on their list. There was nothing they could do to fix the logistical flaw, she told me. My phone wouldn’t place calls in Denmark, and the WiFi didn’t work. I was forced to buy another ticket home, leaving the next day, and figure out logistics that night on my own. When I was abroad, I learned to be a lone pine. Now it is now senior year. My time on “Lodj croo” for First-Year Trips has just ended, which means that my voice has finally returned to normal and my brightly dyed hair has faded to a nice shade of blonde. I just spent three weeks welcoming in a class of excited freshmen, reflecting on what it means to call a place “home.” On Trips, we discussed how to develop and sustain positive communities and worked to assure new students that they would definitely find their place — their people — on campus. But as I stood, foot perched on the stump, I realized that it is not about finding your specific place at this school; it’s about finding the confidence to be your own lone pine, your own best version of yourself, so that you can make any community your community. Freshman year Allie sought out communities that were comfortable and familiar: communities that I could touch with my hands and easily label. Sophomore year Allie started to question those labels, wonder what it means to be a part of these structures and interrogate the meaningfulness of those communities. Junior year Allie experienced a dose of the “real world,” or at least, the world beyond Dartmouth, and she was forced into independence. I realized the value in being alone and the value in learning from yourself. And senior year Allie — well, she still has a lot to learn. During my time here, I have discovered that Dartmouth has many a meaningful forest. But to change the communities you care about, you have to put in time. And in addition to the forests, I will forever be grateful to Dartmouth for the lone pines — the fiercely individual friends — I have gathered along the way. They have, and, I hope, will continue to stand with me on this crazy journey through life’s winding trails.